We camped at the Bureau of Land Management Deer Creek Campground (6 miles East of Boulder on the Burr Trail) right by the river, and it was a very secluded and small campground that we both enjoyed. There are only 7 campsites, and we chose it because it was cheap and still had a bathroom. Even though we woke up early, the drive to Arches was almost 4 hours. We happened to pick up a brochure of the Scenic Byway 12, and we decided to take it. The views were one of a kind, and the part along the Hogsback was incredible and exhilarating! I HIGHLY RECOMMEND it, it's a nice change of scenery driving through Utah. We also jumped out of the car to snap a picture of Capitol Reef NP when we drove through it. so we got there around noon. The first view we got was the incredible Park Ave.
We then turned right to head to Turret Arch, passing Ham Rock (pretty funny looking) and Parade of Elephants. We decided to get out and do the short 1 mile hike around the Windows and Turret Arch. It is an easy hike, and we did it in flip flops because it was so hot. So you get an idea of how big some of these arches are! We got back in the car and headed to Landscape Arch, the one on the cover of the visitor guide and the one Clark most wanted to see. We parked at Devil's Garden TH parking area. 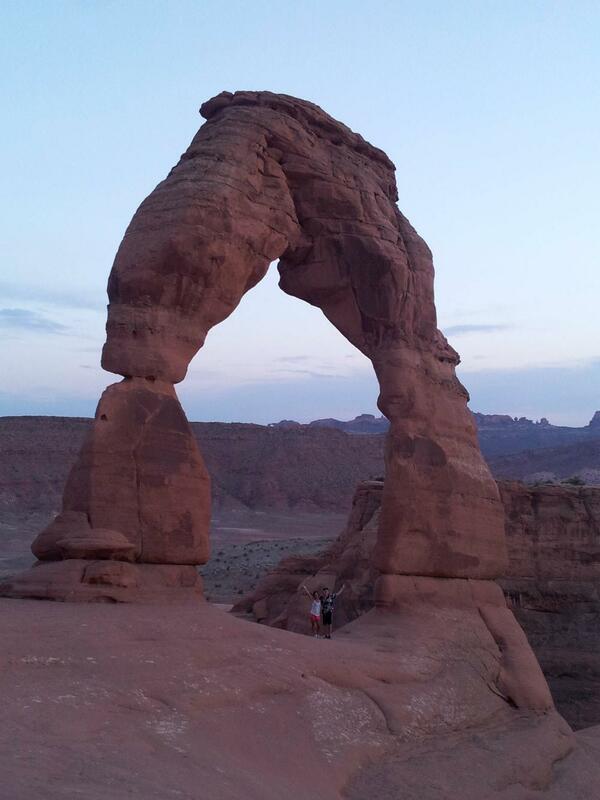 The entire 7.2 mile RT hike would take you past 8 arches. We did the hike just to see Landscape Arch, and Clark was slightly disappointed we couldn't get closer to it. After this hike the sun was starting to set, so we hurried to our last destination - the famous Delicate Arch. We parked at the Wolfe Ranch parking lot and practically ran up the slickrock, hoping to catch the sunset from the Arch. The trail was 1.5 miles one way (480' change in elevation) following rock cairns the whole way. We caught the sunset on the way up and snapped a picture from the side of the mountain before continuing on. The hike up is slightly confusing since it doesn't seem like an arch would be all the way up here, but after you come around a corner, you suddenly see it. There was a 200 yard section on a slight rock ledge towards the end as well. There were lots of people watching the sunset from the surrounding amphitheater, and there was even a small line to take a picture under the arch. After the color faded from the sky, we hiked back down using our headlamps. Arches was a fun day excursion to be a tourist and snap pictures without doing any heavy hiking.